When we decided to spend a weekend up in the Blue Mountains west of Sydney, we wanted to stay somewhere nice, somewhere with a fire place, enough restaurants on the property or close by to keep us well fed and most importantly a nice bar where we could sip delicious wine in the evening and just relax and unwind. 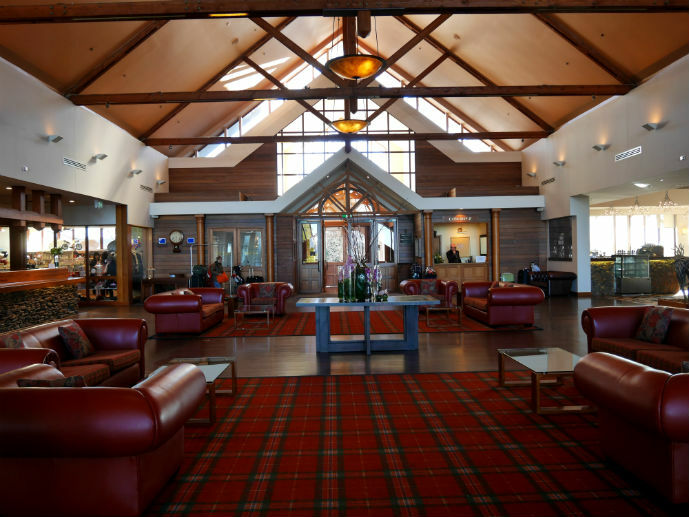 There isn’t a big range of hotels that offer exactly what we were after, so the obvious choose was the Fairmont Resort Blue Mountains located in the town of Leura. 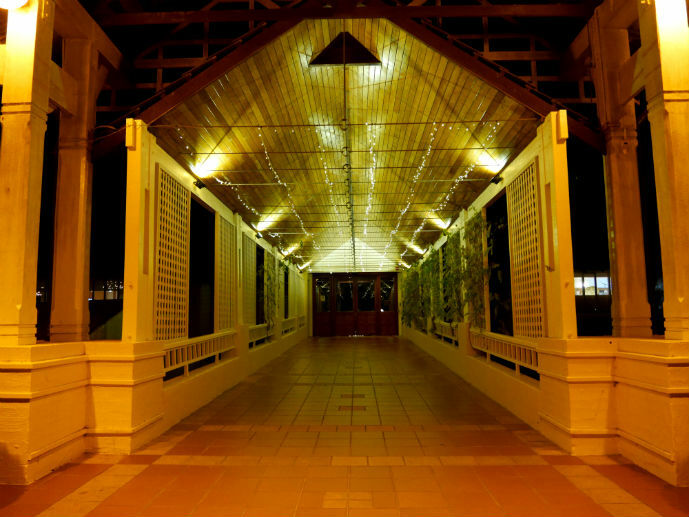 The resort has passed through many owners, seen it’s fair share of controversy and undergone many refurbishments in it’s over 25 years of operation. Now in the hands of the Accor Group under the M Gallery branding, the resort is undergoing its biggest refurbishment yet in the hope they can bring it back to being the icon that it once was. Arriving in the evening after dark, I felt slightly disorientated about where exactly we were and what surrounds the resort. The entrance leads off a dead end street which takes leads down to the resort via a long driveway. Parking the car in the top car park near the entrance, which we later learned was a rare opportunity, we were greeted by a long covered entrance way strung with fairy lights which we found very welcoming and beckoning to walk through into the main foyer. There are two sets of wooden sliding doors to pass through and as the second set opens I’m greeted by one of the most welcoming hotel foyers I’ve seen to date. The dark wooden flooring is broken up in the middle of the room by rugs in warming tones for rust colour reds and oranges, blending perfectly with the oversized rust colour leather sofas that just beckon you to come take a seat. To the left is the bar which again, looks very inviting and I know right away I will be happy to spend my evenings sitting in front of its fire place with a nice glass of wine. Looking straight through the foyer I just know that in the morning, those windows are going to offer some spectacular views (they didn’t disappoint). 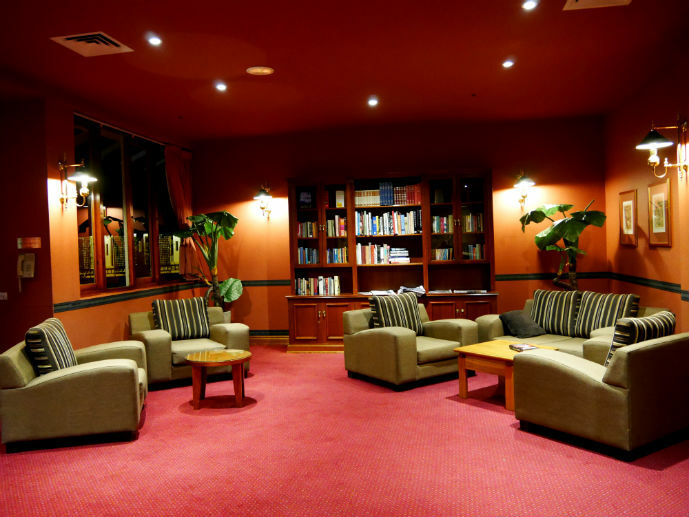 The reception desk is on the right side of the foyer and we are lucky enough to be greeted right away by a friendly member of staff. 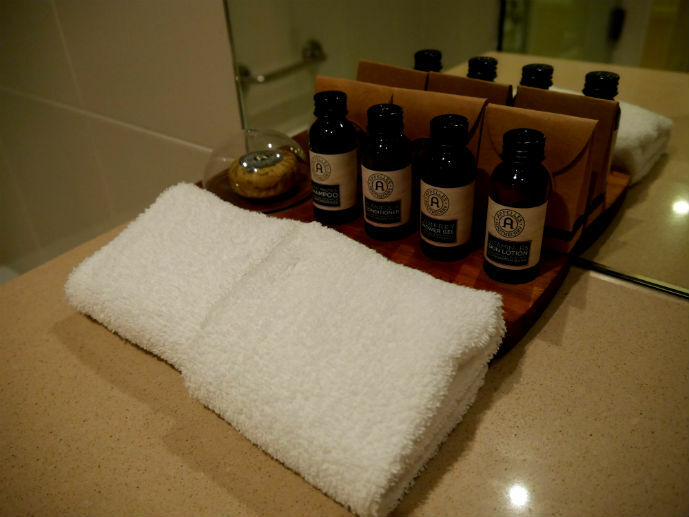 The check-in process goes through the usual motions of taking credit card details and providing directions to the room. The staff are friendly and professional. We are told that our room is in the Jamison Wing which is a long newly carpeted corridor leading off the side of reception. On the walk down the corridor we pass a small gift shop, a children’s merry-go-round, a billiards rooms and a very impressive and inviting library which I make a mental note to try and spend some time there during our stay. Only one of the two lifts are working to take us to our top floor room. We found that throughout our stay we spent a lot of time waiting for the lift to come especially in the morning when it was check out time. The Resort offers over 200 rooms ranging from the standard Fairmont Room up to Luxury Suites. We choose to stay in a Superior Room which is one step up from a Fairmont Room with the major difference being that the Superior rooms are located on the upper floors offering views. Using the electronic key card to enter the room I straight away notice that the warming tones used in the foyer have been transferred to the rooms. 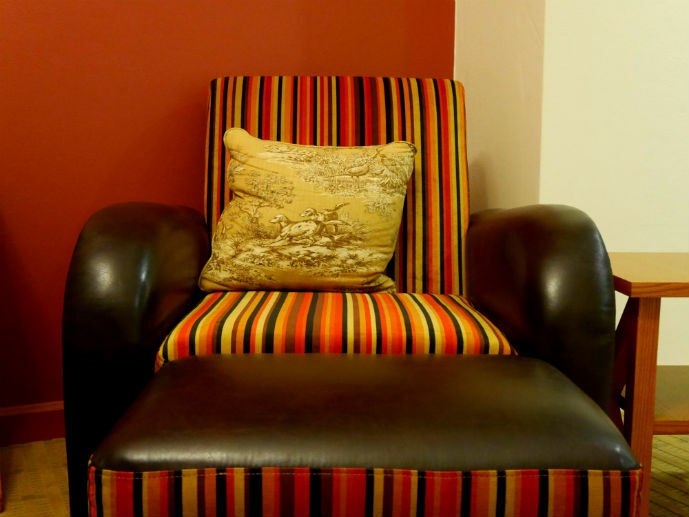 Burnt reds and oranges mixed with gold’s and chocolate browns giving the room a welcoming glow. It’s a larger than average hotel room with a big soft king sized bed full of soft, hard and just right pillows and cushions. There’s a comfy striped lounge chair with matching foot rest which I used quite a lot during the stay to put my aching feet up after long days of walking. 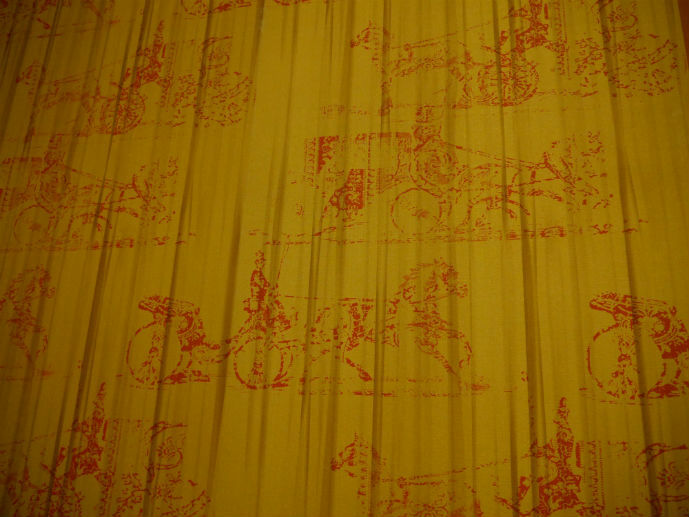 My favourite feature in the room is the vintage looking gold wallpaper with red horse and cart print. In front of the bed is a desk and chair in golden tone wood and match small cupboard containing a small bar fridge and utensils needed to make tea and coffee. Above the desk is a large flat screen TV with all the local channels, a few cable TV channels and on demand pay movies. There’s a long picture window with layered drapes which did the job of blocking out the morning light on the morning we choose to sleep in. On arrival at night we had no idea what sort of view we had. Opening the drapes on our first morning we were greeted with stunning, but slightly obstructed views of the Jamison Valley. If it wasn’t for the over grown gum trees this would have been perfect. 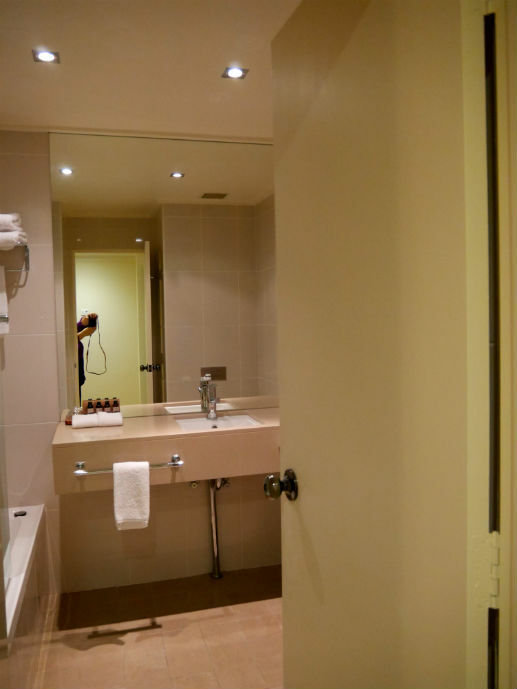 The bathroom was clean and modern with combine bath / shower and sink with ample bench space for our toiletries and the nice smelling bath products offered. The water pressure on the shower was perfect and stayed at temperature. My only gripe with the bathroom was the exhaust system which was ineffective leaving the room steamy and damp for hours after use. All in all it was a very nice room that we found to be spacious, inviting and comfortable. The thing I was most looking forward to doing during our stay was spending the evenings sitting by the fire sipping delicious wine. And I got to do just that in the Sublime Lounge with it becoming my favourite part of the resort. The centrepiece of the bar is an enclosed double sided wood fireplace surrounded by copper sheeting that gives off a great amount of warmth. Above the fireplace on each side are large flat screen TV’s which were constantly set to Fox Sports, luckily for me, with the sound off. The bar made of stacked stone with wooden top and comfortable arrangement of sofa seating adds to the relaxed and homely atmosphere. On offer is a small but good range of local and international wines, tap beers and all the spirits and liqueurs you can think of. They also do tea, coffee and special hot chocolates. 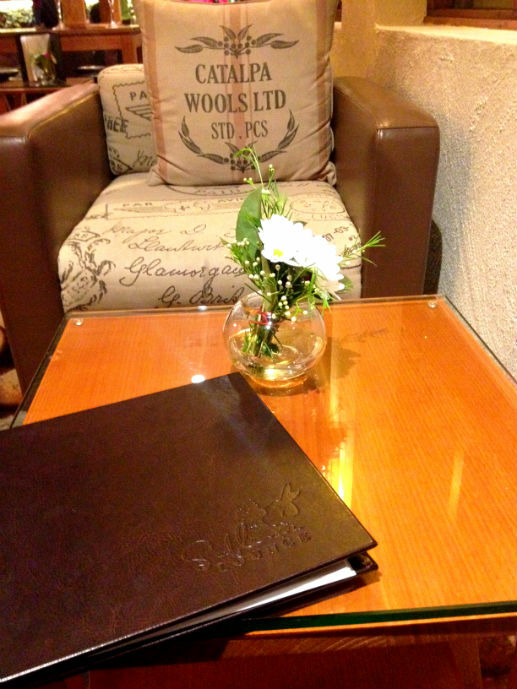 For food, they offer high tea in the afternoon, cakes and slices all day and a range of bar snacks in the evening. The Fairmont describes Eucalypt as their fine dining venue and as a lover of fine food I was excited to be dining there on the first night. 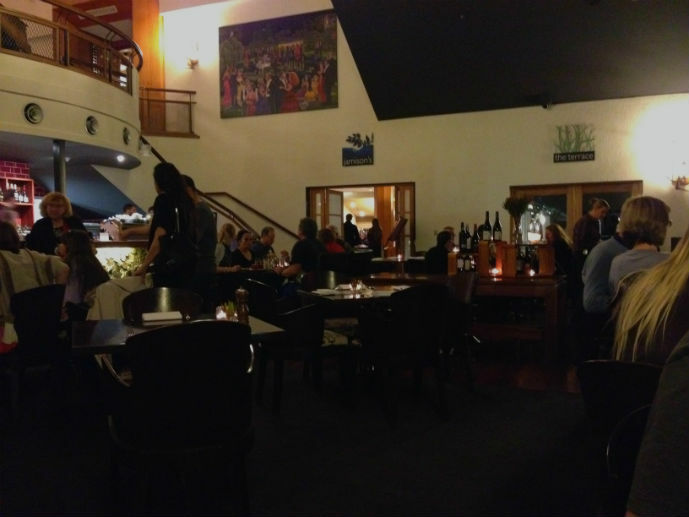 We’ve dined in some of the best restaurants Australia has to offer and unfortunately, for us, Eucalypt just didn’t live up to its fine dining label. Located down stairs under the bar, its decor can really only be described as clinical and boring. Grey carpeting, starched white linen and uncomfortable dark leather chairs, the room lacks decoration or personality and with the location being downstairs there was no opportunity for them to take full advantage of the incredible views that the resort has to offer. The staff were just as clinical, showing no personality and acting with more formality than I have experienced in any other restaurant before. To me, it was completely unnecessary. The chef came around to the tables to speak with the guests during dessert and I couldn’t help but notice his untamed long hair and thinking how unhygienic that was. Now for the food. The menu is small which I like because it means that the chefs can concentrate on a few key elements and do them really well rather than do a lot of things just ok. On paper it reads like a dream and made my mouth water and decision for each course difficult. 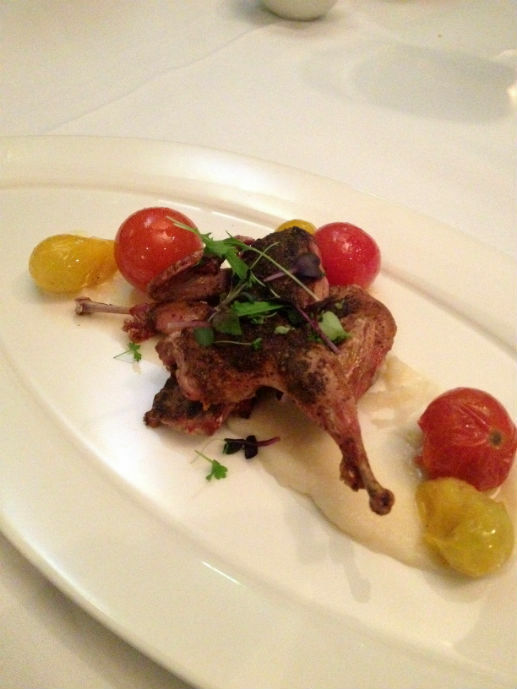 For entree I had the pan roasted quail with blistered heirloom tomatoes, pressed cauliflower and lemon myrtle reduction. The quail itself was perfectly cooked and tasty and the tomatoes delicious but the cauliflower just tasted like salt and I spent my time eating this dish wondering when I would taste the lemon myrtle. Mick went with the homemade gnocchi with wild mushrooms, nut brown butter, Megalong olive tapenade and goats curd. He said his gnocchi was chewy not soft and fluffy, the mushrooms were Swiss browns only, hardly wild, and the whole dish was swimming in salty underdone butter sauce. Hoping that the main meals could redeem our experience, I ordered the Wagyu beef with desiree potatoes, smoked eggplant, blistered tomatoes, and pan jus. The beef was stringy and had an odd flavour, potatoes simply boiled, the jus sticky and over reduced and the eggplant just didn’t go with anything on the plate. 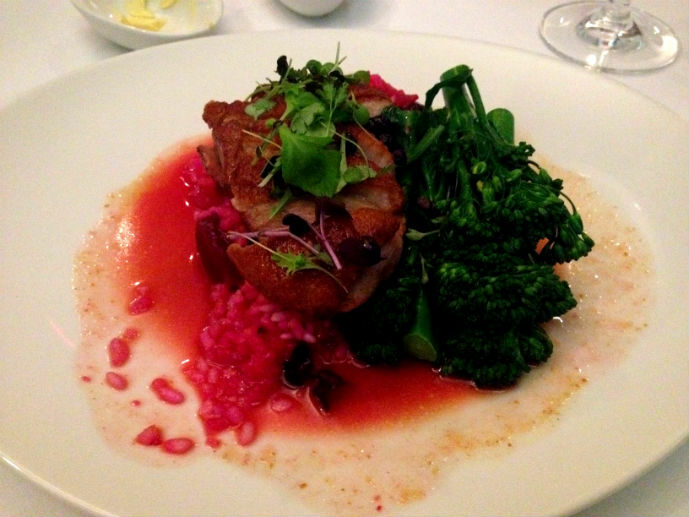 Mick’s pan-seared duck breast with roasted beetroot risotto, broccoli and spiced orange and juniper reduction was a slight improvement but he found the risotto to be very over powering and voluminous, taking over the whole dish. 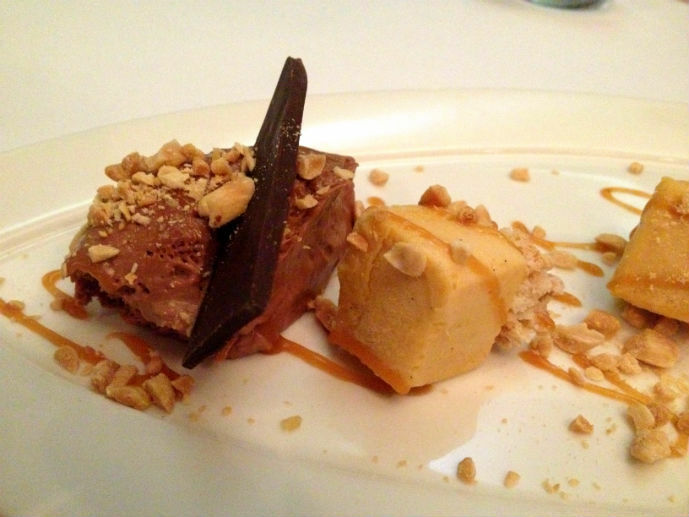 When it came to dessert we decided to share one dessert and after seeing the deconstructed snickers come out to other tables we agreed that would be the one. For the first time that evening we were not disappointed. From the light chocolate mousse, the chewy caramel and delicious and sweet caramel parfait loaded with nuts, it was a perfect, well rounded dessert and beautifully presented. For a three course meal and two glasses of wine each our bill came to just under $AUS170.00 for four plates of food that were unbalanced and not quite right and one pretty much perfect dessert. 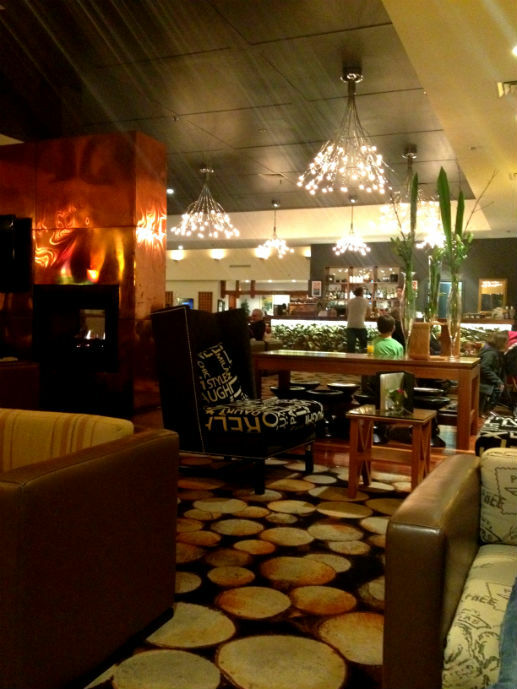 We felt ripped off and would not recommend this as a place to eat when staying at the Fairmont. After our first nights bad dining experience we were sightly reluctant to eat within the resort again but with the resorts location being away from the main town and us both wanting to enjoy a few drinks we decided to give Embers a go on the second night. 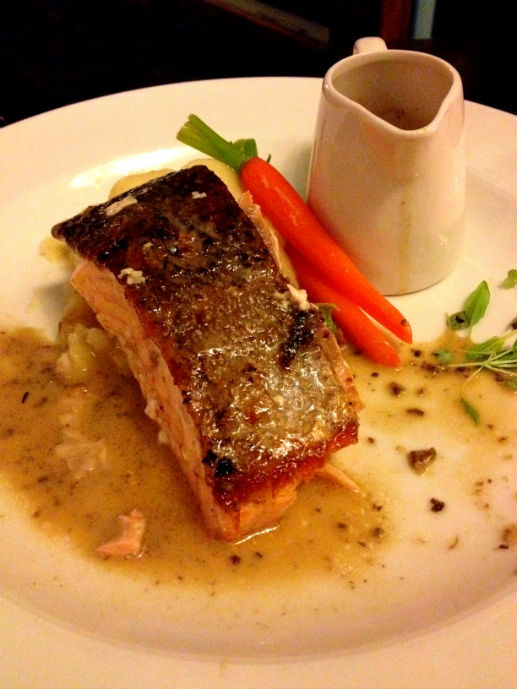 The Fairmont describes Embers as the casual dining experience with a broader ranging menu that caters for families. 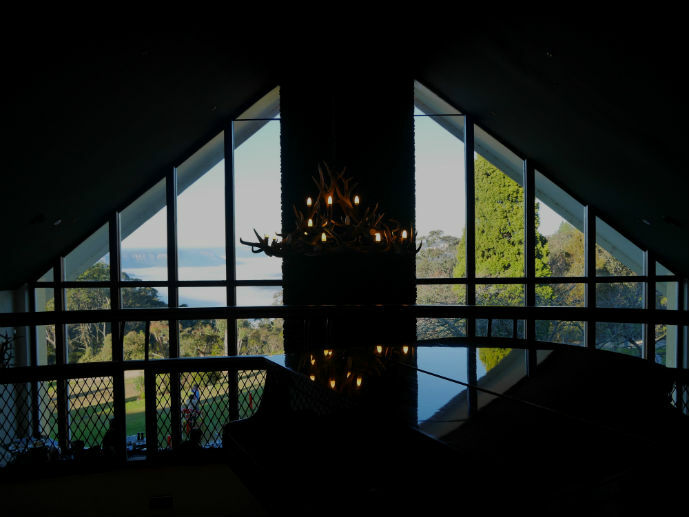 Embers is located at the back of the foyer right against the large triangular windows that look out over the Jamison Valley. Obviously dining at night there is no view but having the glass windows reflect the light from the candles on the tables and roaring open fireplace really adds to the ambiance. It’s got a very homely and intimate feel to it that we both loved and we felt comfortable and relaxed by the setting and welcomed by the friendly and warm staff. Over two nights we enjoyed a number of dishes that, while they weren’t top notch, they were what you would expect from a casual dining experience. 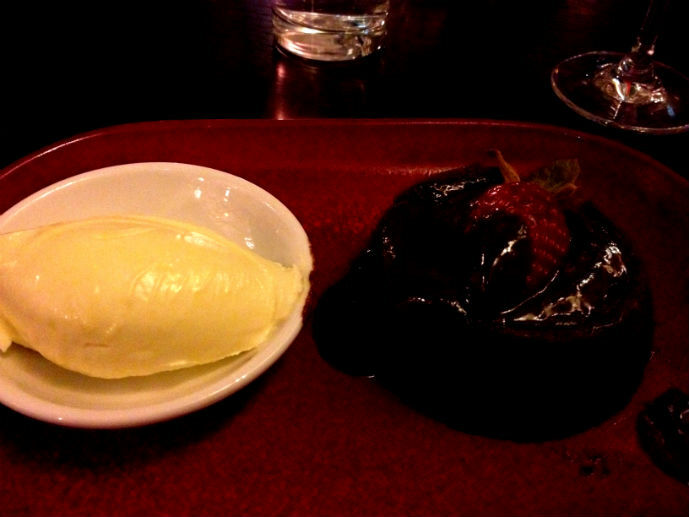 Highlights included the delicious molten chocolate pudding, a perfectly cooked salmon fillet with crispy skin, tasty lamb blackstrap with a delicious jus and one of the best bruschetta entrees I’ve had consisting of perfectly ripe tomatoes, sticky balsamic reduction and creamy goats cheese. Also on the menu are a selection of pizzas and burgers which all looked good coming out to the tables. Each night we had two courses and two wines each with the bill coming in under $AUS100.00 each time. We would happily eat there again and recommend to anyone staying in the resort. This is where we had our included buffet breakfast each morning and where you can enjoy the Saturday night seafood buffet which we didn’t try because of the hefty $79.00 per person cost. Located next door to Embers and adjoining a large terrace which would be a great place to enjoy lunch in the summer months, Jamison’s is probably the shabbiest looking room in the hotel. The carpet is dated, tables and chairs old and rocky and every morning when we went in for breakfast, we found it unappealing and chaotic with no order what so over to seating or serving food. The breakfast buffet included all of the usual hot items of eggs, bacon, sausages etc., cereals, fruits, muffins, breads and a delicious selection of hot pastries which I enjoyed the most. Other than the pastries everything else was satisfactory and on par with a moderately priced hotel buffet. I did expect it to be slightly better given the resorts four and a half star rating but it did the trick of starting our days of walking with a filling and hearty meal. 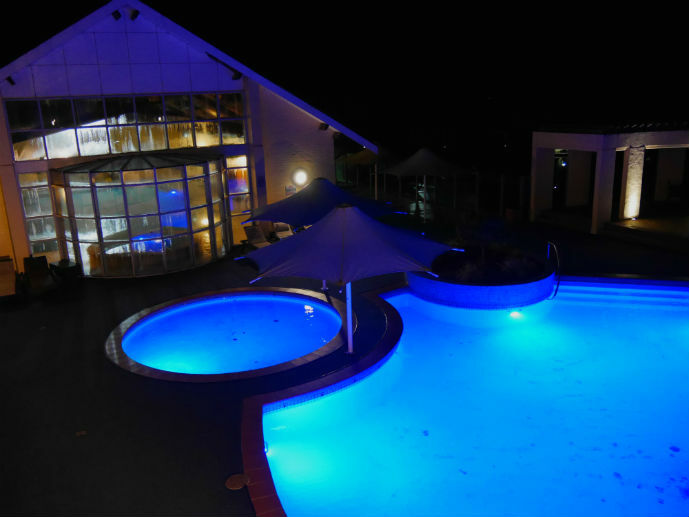 If you are looking for a place to spend your evenings after days out exploring the local area that offers a comfortable, inviting, mountain style setting with plenty of facilities to help you relax, then yes, this is the place for you. 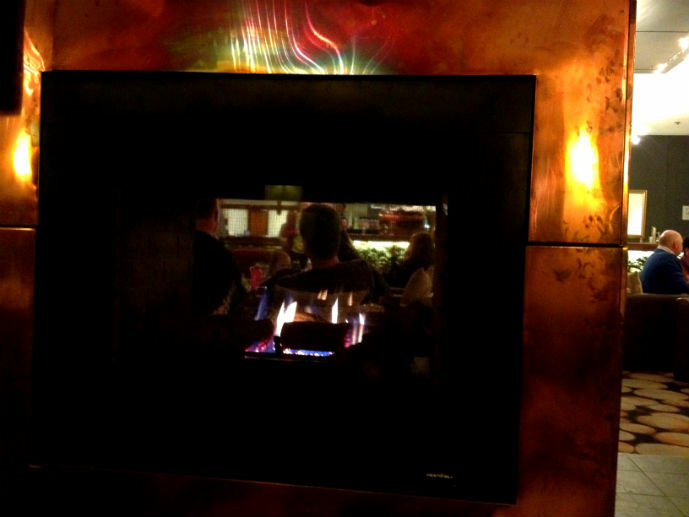 Enjoy relaxing in the bar in the evening by the fire and eating in Embers for a reasonably priced tasty, but simple meal. 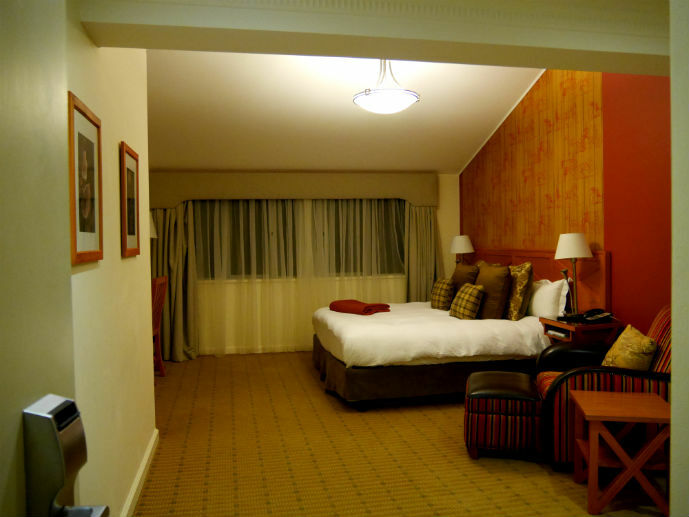 And enjoy the comfortable and spacious rooms with all of the amenities that you could possibly need. However, if you are looking for more personal service and fine dining, then this isn’t the place for you. While the staff were friendly, by no means did they go out of their way to make our stay extra special and the fine dining option is lacking and fell way short of being a fine dining experience for me. Because of the high rates the resort charges, I expected it to be mostly visited by couples and international guests, but I was surprised to find the majority of guest were young families enjoying a weekend away. If you are travelling with kids then there is plenty to keep them happy within the resort. Getting there: Driving takes just over 1.5 hours from Sydney CBD via the M4 Motorway and Great Western Hwy. Trains run on the Blue Mountains Line from Sydney Central to Leura station in just under 2 hours. 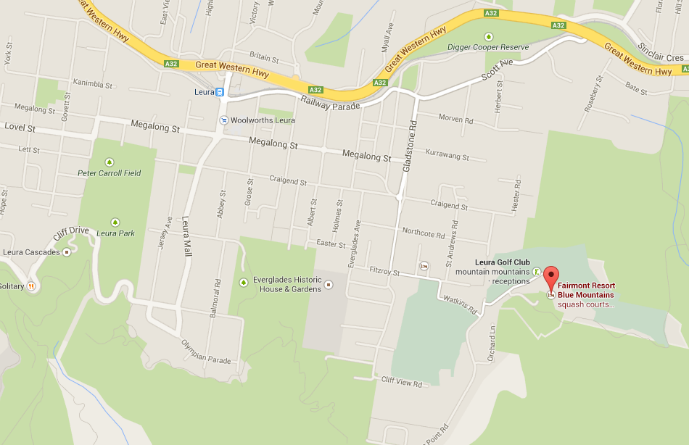 Once you get to Leura station a taxi is necessary to get to the Fairmont. Getting around: If you don’t have your own car you may find it difficult because of the resorts location away from the main town. 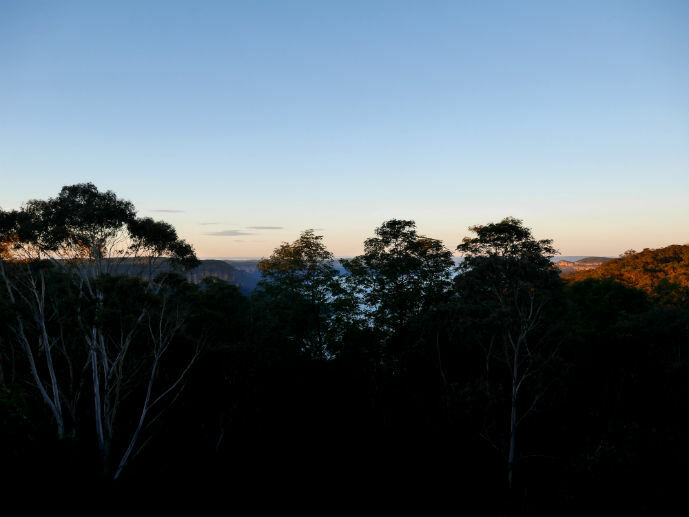 However, the hop on hop off Blue Mountains Explorer Bus and Trolley Tour both make stops throughout the day at the resort taking you to the major sights and towns in the area. At night a taxi would be necessary to get into town for restaurants. Rates: Our stay in a Superior Room for three nights over a weekend in late June cost $AUS800.00 booked directly with the Fairmont on their website. 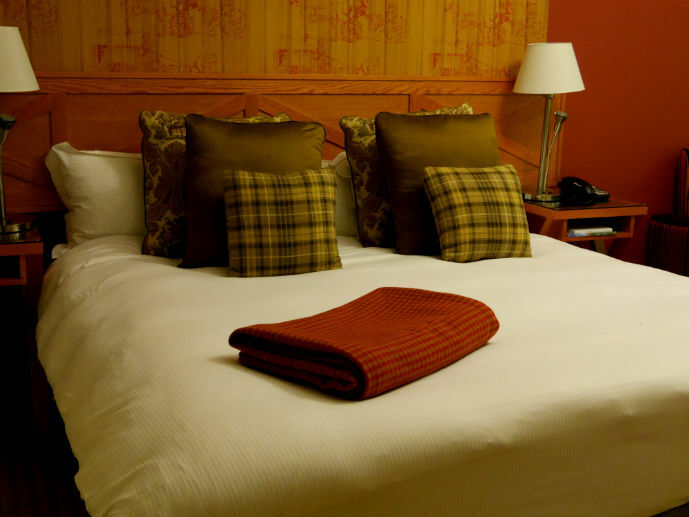 Cheaper rates are available for standard rooms, mid-week and at off peak times. 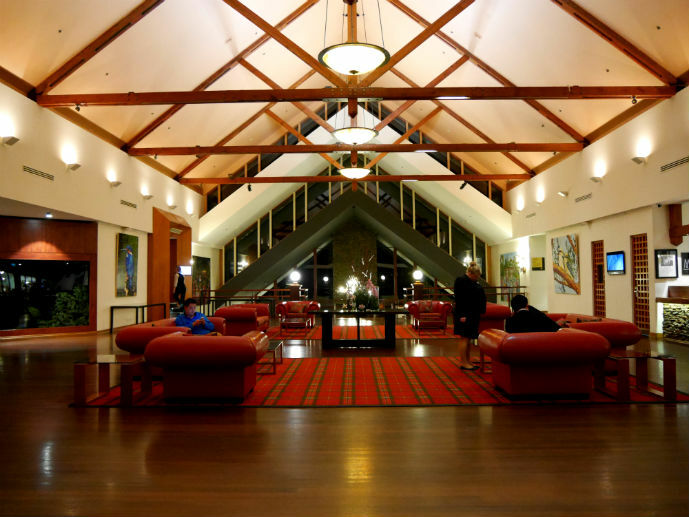 Book the Fairmont Resort for your next trip to the Blue Mountains. Is this a place you’d like to stay? 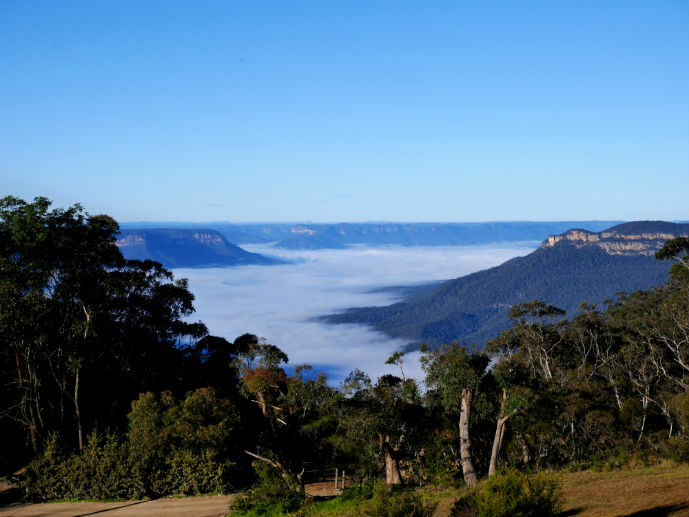 Or have you been to the Blue Mountains before? Where did you stay and would you recommend it? It looks like a beautiful Hotel and what a view! Shame about the overpriced and lacklustre food though. It was a shame but I the accommodation and foyer made the stay worth it for us. Wow! The view from the terrace is absolutely breathtaking. I know right! We were pretty blown away ourselves.